If you’re looking for an excellent entry level SLR, here’s a great deal for the Canon Rebel T2i and a telephoto lens at Amazon.com. I recently picked one of with a similar deal on Black Friday. For about $800 you get the Canon T2i, TWO lenses, and a 4 gig flash card. The lenses that you get are the 18-55mm kit lens and the 55-250mm telephoto. Both are image stabilized lenses which helps prevent blurriness when zoomed in. 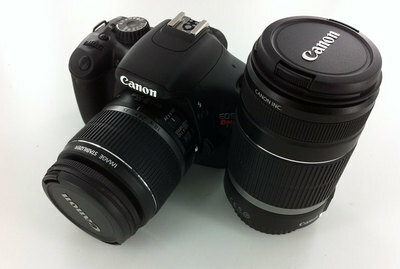 To get the deal go the Canon EOS Rebel T2i + Telephoto Lens page and add the T2i and the 55-250 lens to your cart. The 55-250 is a much better lens than the 75-300 lens that is also listed because 55-250 is image stabilized while the 75-300 is not. Add the Transcend 4 GB Class 6 SDHC Flash Memory Card to your cart and you get it free. I’ve been playing with my new Canon Rebel T2i for a day and it’s nice. It’s a huge upgrade from my original Digital Rebel.